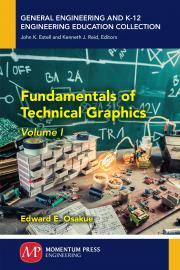 Fundamentals of Technical Graphics concentrates on the main concepts and principles of technical graphics. The book is divided into two volumes: volume one contains chapters one to five, whereas volume two comprises of chapters six to ten. Volume one covers the topics of drafting guidelines, free hand sketching, computer design drafting (CDD) systems, geometric and shape construction, and standard multiview drawing creation. Volume two treats the topics of auxiliary views, section views, basic dimensioning, isometric drawings, and working drawings. The appendices provide introductory discussions about screw fasteners, general and geometric tolerancing, and surface quality and symbols. The book is written with current drafting standards of American National Standards Institute/American Society for Mechanical Engineers (ANSI/ASME) in mind. The style is plain and discussions are straight to the point. Its principle goal is meeting the needs of first and second-year students in engineering, engineering technology, design technology, and related disciplines. Edward E. Osakue is an associate professor in the department of industrial technology at Texas Southern University, Houston, Texas. He is also an adjunct faculty of engineering drafting and design department at Houston Community College, Houston, Texas. Edward Osakue was the education supervisor/chair of the school of drafting and design at ITT Technical Institute, Houston South. He was a faculty at the department of production engineering, University of Benin, Benin City, Nigeria, from 1984 to 1992.